Already have a Security System??? In Most Cases, EEI Security Can Test and Reprogram Your System for Burglary Monitoring at NO COST To You!!! Call for Details (813) 264-1907. ATTENTION MEMBERS OF THE ARMED FORCES!!! Deployed to Iraq, Afghanistan or other Middle Eastern Combat Zones? EEI Security will monitor your home security while you are away for FREE. CALL FOR DETAILS: (813) 264-1907. Every time EEI activates new monitoring services from a customer referral, that customer earns 3 free months of monitoring. We have had EEI I for 21+ years and are very happy with their central monitoring station and technicians when we need them. You have always provided excellent service & customer care over the years! P.S. Love the new full-size envelopes! Happy Holidays! All of EEI Security employees are great people. Techs are professional and informative. I’m glad I chose EEI Security system for my home. I would recommend EEI to everyone. Thank you for your great service. Good job. Always quick response. I am very pleased with your system so far. The customer service has been great and the response time is in a timely manner so far. Keep up the good work. You are always very helpful and knowledgeable in solving my problems. Great people and system! 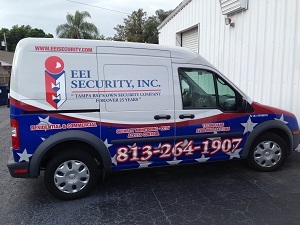 Excellent company to be with – I have been with EEI Security for the last 15 years. They are professional & I have always recommended them to my family & Friends over the last 15 years & still continue in the future as well. I am very comfortable with your company. You have never let me down. I have been with you all thirty something years. Great service – every time alarm goes off someone calls. Operators are excellent. The one time I was really scared though of something the female operator stayed on the line with me while she called the police. She was great. We have had your services for many years (over 20). We are very pleased. Service is excellent & response time very good. Thinking of upgrading system next year. Our mission, as the Largest Veteran-owned, Independent Security Company in the Greater Tampa Bay Area, is to use our 175 plus years of combined experience to provide the best burglary, fire, and surveillance systems and service available at the best value. We provide 100% Customer Satisfaction! Whether you need to secure your home or business, we contrast ourselves from other dealers by completing the EEI Security Assessment. Our assessment not only covers the interior and exterior of the property, it includes a one-on-one, thorough discussion with the owner allowing us to customize your security to specifically handle your complete needs, versus the competitor’s philosophy of just counting doors and windows to fit you into a “package”. Security is our Passion! Regardless of how big or small your security needs are, count on EEI Security’s State Certified and factory-trained technicians to think about the details, so you don’t have to.